The natural resources abundance in a region is likely would contribute to the welfare of the people. However, initial observations on some natural resourcesrich regions in Indonesia revealed a different fact: the resources-rich regions are mostly ranked in the lowest level of social welfare development indicators. This research seeks to find the evidences of natural resources curse at the local level in Indonesia. It focuses in the two channel of the curse: the economic disruption and the political economy model. To find the evidences of the economic disruption symptoms, it examines the effect of the natural resources extraction to other economic sectors and level of employment. Under the political economy model, it focuses on the utilisation of revenue from natural resources extraction and the budget priorities of LGs. 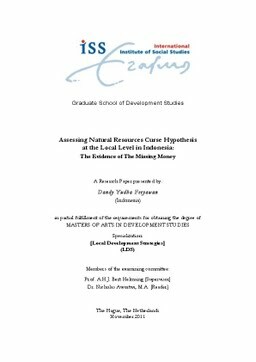 When the analysis shows the evidences of the curse, the investigation continues to find the missing money from the natural resources revenue. This research’s hypothesis is that decentralization tends to push resource-curse symptoms to sub-national levels, where the cases can be because of the lack capacity of local governments to address the problems. This research finds little evidence of the curse mechanism through the economic disruption model with the small correlation between natural resources extraction to the local economy. Moreover, the analysis suggests that inspite of received huge revenue windfall from natural resources-rents, the resources- rich LGs failed to deliver better public services compare to those without. The study measures the public service provisions outcomes in human development, infrastructure quality, and poverty level. Inappropriate investment and the misuses of funds are two main causes of the money gone. There are also some initial evidences of the local leader’s behaviour in creating the patronage political system to continues to stay in power.